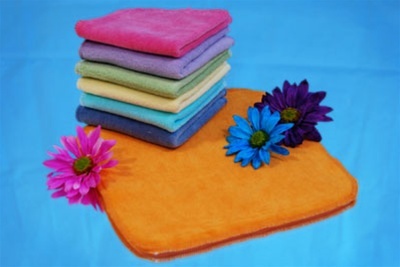 Luxurious fabric - super soft Cotton Velour in vibrant colors. Opposite side is delicate microfleece. Measuring 8" x 8", these wipes fit great in any portable wipe container when folded in half. Color-fast dye, machine wash warm or hot right alongside your diapers. Some shrinkage is normal.